What does FARK Stand For? That part is used only on coupe fark. This kit still allows you to replace the amp in your 2011 & Up Camaro Convertible with a better more powerful aftermarket amp. The harnesses listed above actually connect to the audio harnesses in your car so that you can connect them to your new amp without cutting the ends off your car's wiring harnesses. Please note that the Camaro Convertible has a subwoofer behind the rear seat being pushed by two channels of the factory boston amp. If you wish to power this sub with your aftermarket setup, you will need to install a 5 channel amp or a 4 channel amp and subwoofer amp. 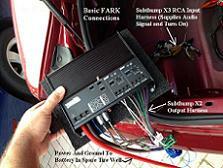 The FARK kit utilizes all of the car's wiring from the amp to each speaker, but does not have provisions for the subwoofer. The wiring is too small anyhow. To power the sub properly, you will need to run a short length of 12 ga. speaker wire from your installed amp and connect to the sub. Do you own a new Camaro Convertible and feel your Boston Sound System is letting you down? Well now you have the ability to replace your weak stock amplifier with any aftermarket amplifier of your liking. We have developed a plug and play kit that connects to your new amp and interfaces with the stock audio harnesses and connectors. You will not have to cut any of your cars wiring. You will not have to run new wiring to all of your speakers. You will not have to retain the factory amp and leave it partially connected to keep crazy things from happening or keep certian car functions working. Our kit allows the complete removal of the stock amp. See video above. With your aftermarket amp connected via our kit, your speakers will get more power and cleaner signals. This allows for better clarity, and higher output. Plus, by having independent control of the amps settings, you will have complete control of your system for better overall sound reproduction. All functions of the car are retained with our kit. Chime, onstar, backup sensors, etc still function as usual. Since the kit is plug and play and no wires were cut, you can go back to stock quickly and easily. This is a complete kit of just the required interface harnesses as mentioned for convertible only. Some of you may already own our 4 channel X3 plug and play RCA harness that is included in the kit. If you already own this harness, there is no reason purchase another. You may simply de-select the X3 harness in the menu box and it will be deducted and removed. Additionally, you may purchase some of the optional equipment shown below such as the power and ground cable for your new amp and our factory fit amp rack.